Win a $100 Gift Certificate to Davanti Enoteca! Congratulations to Olivia Bator on winning our fifty second High Five Giveaway and thank you to all who entered! 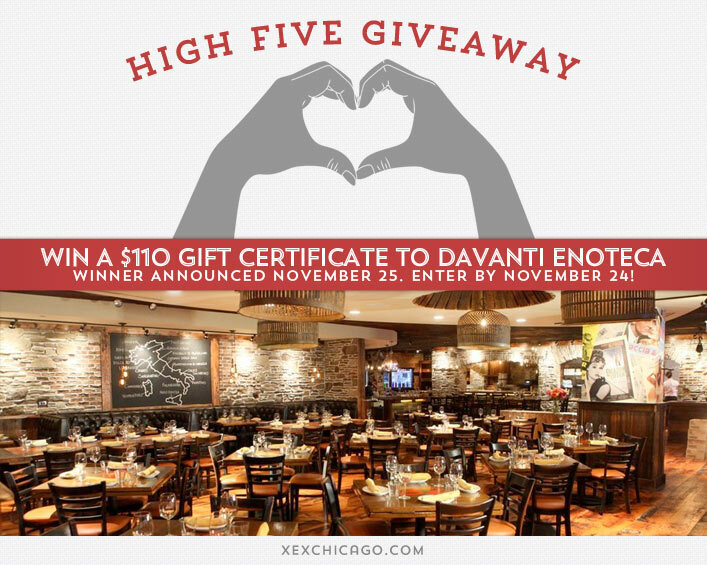 Our next High Five Giveaway is for a $100 gift certificate to Davanti Enoteca. When restaurateur Scott Harris decided to open his latest restaurant concept, he and the team of chefs from Francesca’s Restaurants did their research. Although already experts in their own right for rustic, Italian cuisine in Chicago, the chefs traveled across the country, eating and tasting to discover how chefs nationwide defined this cuisine. Inspired by their travels, the team is proud to introduce the new wine bar and restaurant: Davanti Enoteca in Little Italy. Davanti Enoteca (located kitty-corner from Francesca’s on Taylor) carries the theme of our cuisine of simple Italian fare throughout the décor of the rustic wine bar and restaurant. The two back walls feature beautiful arched exposed brick which will serve as the retail wine section as well as the selection of bottles that guests can enjoy at their table. Davanti Enoteca is located at 1359 West Taylor Street. Visit their website at www.davantirivernorth.com or call them at 312-605-5900 for more information. Should you use a wide-toothed comb or a brush to remove tangles in your hair? Now, just add a comment to this post with the right answer to be eligible to win! The winner will be announced on Monday, November 25. Entries must be received by midnight on Sunday, November 24. Good luck! A wide toothed comb! Thanks so much, love your salon!! You should use a wide-toothed comb – always!! !